The history of Japanese tattoos is ancient and it is said that people from the Neolithic Age (Jomon Period, 16,000 years ago) used to tattoo their faces. 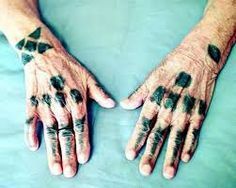 The fishermen in the Kyushu region of the 3rd century kept tattoos of a pattern called “Bunshin” to protect themselves from water-related problems. In the 8th century, men has used tattoos around their eyes. 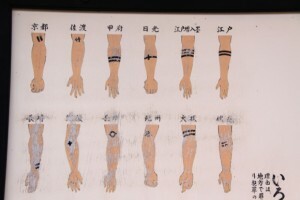 Records of these tattoos remain. In Hokkaido, Okinawa and the Amami Islands, there was a tradition of putting tribal tattoo patterns on the hands and other body parts of women as a rite of passage until the beginning of the 20th century. 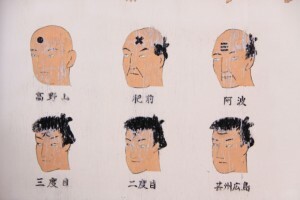 According to the information above, it can be seen that tattoos have undergone various transformations in Japan under the influence of social fluctuations. Today, we see the customs and opinions of each region differ dependent on the changing trends and times. It was in the Edo period (from 1603 to 1868) when Japanese tattoos had developed into the unusually beautiful patterns we see today. These are characterized by composing the entire body with painting-like narratives in the shape of a kimono-style wrap, as a symbol of masculinity. This became especially popular among chefs of the time and was called “horimono“, or “carver”. The development of “Ukiyoe” culture started by Utagawa Kunihiro had a big influence on this style of tattoo, sometimes calling the recipient of these tattoos “Ikita Ukiyoe“, or “living Ukiyoe painting”. During the Edo period, there were often town fires in many of the wooden structures. As so, craftsmen would often bravely face these fires and earn respect of the towns people. During this time, the culture of craftsmen was very popular. 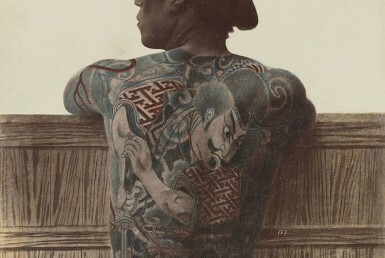 Ukiyoe, Kabuki, Sumo, Rakugo, Karyukai were all popular professions, although many of them sported full-body tattoos. During this time, in the “Karyukai“, or “world of geisha (also including the pleasure districts)”, a tattoo in the shape of a mole was placed on both the prostitute and customer to show their love and affection for one another. This also strengthened the bond between a specific customer and prostitute, prompting the customer to keep coming back. Meanwhile, in 1720 (middle of the Edo period), tattoos were adopted into a form of punishment for mild burglary, resembling Chinese punishment during similar times. Before then, misdemeanors resulted in the cutting off of one’s nose or ears. It was considered to be too brutal, and thus tattoos marked these criminals in place of the mutilation. The tattoo punishment was often on the forehead or the arm, but placement varies depending on the area. In the case of Edo (present day Tokyo), it was typically two lines under the elbow. On the forehead, an “X” mark or the kanji “悪”, meaning “evil”, for first offenders. For second offenders, a slash would be made over the original tattoo. For recurring offenders, the kanji “犬” for dog would be placed on criminals in some cases. Although there was meaning behind implementing this type of punishment by simply looking at someone to see if they were a criminal or not, there were many negative aspects to this. The criminals often lost the ability to rehabilitate since the tattoos were permanent. Because of this, many people would use their tattoos to scare or blackmail others while others would tattoo over their marks which was prevalent among craftsmen. From the Edo period to present day, craftsmen proudly insist that people do not call their tattoos “irezumi” but instead “horimono” to show their professional nature. 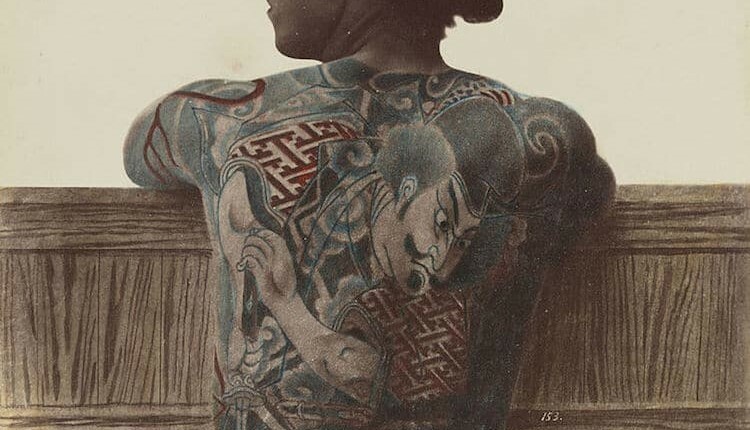 It has been about 300 years ago that offenders were imprisoned and had tattoos placed on them, yet even in the 21st century, the word “irezumi” still leaves the dark image of a criminal in many Japanese minds. However, after the Edo era ended in 1868, Japan was thrown into a world of change with the influence of Western modernization that pushed their own policies. In 1869, in order to not be considered a barbarian nation from Western countries, Japan abolished the existing system and in 1870, the tattoo imprisonment system was abolished. Firefighting by citizens was also abolished in 1880 and a system made of civil servants was created in its place. In 1908, the Meiji government thought to break old habits and promote westernization by introducing new punishments for tattoo engravers and clients to jail time less than 30 days or a fine less than 20 yen. In fact, it was rarely charged and mainly tolerated, allowing artists to successfully engrave without being interrupted. Writer Junichiro Tanizaki wrote an excellent piece of work called “Shisei”. After WWII, a new Japanese Constitution was enacted in 1947 and the penal code regulating tattoos was abolished the following year. Under the existing constitution, the lives of Japanese people was said to change and dramatically become richer. When the Tokyo Olympic Games was held in 1964, the overseas travel ban was lifted and artists from around the world came to visit and buy tattoo inks and eventually new machines came out. Japanese tattooing became modernized, tools changed from the traditional bamboo-carving to electric machines and quality improved greatly. In the 1960’s, yakuza movies came out in the Japanese market and became very popular. Because these masculine characters were all characterized with having tattoos, the image of “tattoo = yakuza” was born. Also, in the 1980’s, yakuza cases had increased and many cases involving the smuggling of guns had intensified and society became more aware of the yakuza. Thus, in 1992, the “Gang Countermeasure Law” was enacted to stop yakuza from playing a prominent part in society. However, local businesses and societies were afraid that if they directly discriminated against yakuza, they would be targeted themselves so they started discriminating those with tattoos instead. Meanwhile, in the 80’s and 90’s, new youth culture came into Japan from abroad including music and fashion. Japanese would often go abroad to get tattoos and western-style tattoos also increased in Japan. Conversely, popular stars such as Motley Crue and Lenny Kravitz had Japanese-style tattoos put on them while performing in Japan, having young people reaffirm their traditional cultural values with new ones. Eventually, those who were neither craftsmen nor yakuza began to get tattoos aligning with their individual values. A new style of tattoo was named abroad, simply called “Japanese style tattoo”, making a big storm in the global tattoo industry since the 1990’s. However, in Japan, many assume tattoos should be kept hidden as it had been prohibited for a long time. Indeed, many people in Japan today have never even seen a real tattoo up close, especially the elderly who still equate tattoos with yakuza symbolism. Many parents also urge their children to never get tattoos as it can be hard to distinguish between yakuza and common citizens nowadays. This is why the “all-inclusive refusal” still occurs today in common facilities. Now, we have entered the 21st century and many people hope that we can have warm, cultural exchanges in fashion, sports, music, art, etc. through the beauty of tattoos.